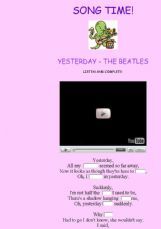 Yesterday - the Beatles Students can listen to the song and complete the missing words. A soft song with easy listening exercises... :)! they listen to the song and find words in the word search and choose the right option. This online exercise is based on the song Fairy Tale Gone Bad by the rock band Sunrise Avenue. 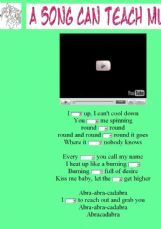 The students listen to the song and put the pictures in the right order according to the lyrics. Then they listen again and fill in the missing words. You can also find a printable version of this OE here. http://www.eslprintables.com/printable.asp?id=583325#thetop Have a nice week! Listening activity using Tim Burton�s Alice soundtrack. 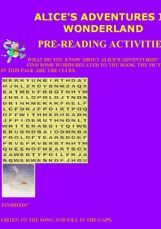 This term we�re reading Alice�s adventures and I use it as an introduction to the reading. They listen to the song and write the missing words. 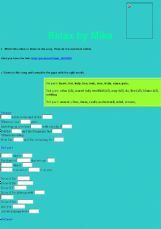 A Reading Comprehension activity (Crossword) about the artist and a beautiful song to develop listening skills. Easy to learn.